The mural “Growing Minds” by Laila Espinoza, which now graces the kindergarten yard at Fairmont School, was dedicated to outgoing Principal Brenda Surgers at the school’s Open House on May 28. Depicting the inspirational profiles of two faces looking at each other, the branches of trees intertwining, the sun, flowers and butterflies, the mural brings to mind the endless possibilities that come with knowledge. Taking almost three months to complete, the debut mural by artist and art teacher Laila exposes the work of an artist to a broader audience. The mural faces the parking lot of the El Cerrito Library. Laila's mural was commissioned early this year by the Fairmont PTA, which felt that a work of art in the public sphere would add significantly to the daily experience of every student at the school. The mural theme of “Growing Minds” is a continuation of the school's vision as a great place to grow, which has also inspired the establishment of a PTA-sponsored edible garden. 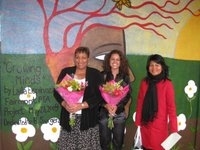 Almost all 60 kindergarten students at FairmontSchool took part in creating the mural by painting flowers and grasses. parents and guardians Alejandra Escobedo and Jeff Sochet; Barbara Bates; Karen Novak; and Rick Arroyo for their generous donation which would go towards preserving the mural. Afro-Colombian dancer Johanna Suarez and her FASEP dance students were not to be outdone. 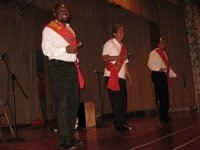 The students danced to salsa and Afro-Colombian music. Johanna is part of the Afro-Colombian dance company "Colombian Soul" in San Francisco and the Afro-Peruvian dance company "De Rompe y Raja." Student art works were also on display throughout the school. Johanna Suarez, and the FASEP dance students. The annual Fairmont Olympics was held on May 21, with grades K-3 students taking part in the morning and grades 4-6 students in the afternoon. There were five events, including Frisbee toss, jump rope, jogging, hula hoop, ball toss and basketball. All participants received a healthy treat donated by Clif Bar after the event was over. The Olympics is a fundraiser for Sports4Kids. We also had a great turnout of volunteers at the event. Thanks to all teachers, parents and guardians for volunteering! Special thanks to Ms. Lambie for spearheading the whole event. Kudos to Ms. Hamala’s fifth grade class for organizing the Kids4Sports Store on Tuesdays. Over the past year, they have earned over $1,000 that will go towards Sports4Kids. We had a great group of parents and Fairmont neighbors together, working really hard to clean up Fairmont on Saturday, April 25! There were around 40 of us, including Fairmont students, kids about to enter Fairmont, and Fairmont alums. We accomplished a lot thanks to their efforts -- the construction of two raised beds and a potting table; the painting of the new beds and some older beds; the removal of diseased bushes and weeds from the edible garden, the front of the school and elsewhere; the spreading of 1 cubic yard of mulch; and the disposal of trash. On April 2, the Fairmont PTA hosted a Family Games Night, sponsored by a grant from the Ed Fund. More than 50 families came to the event. Each grade level had a table in the multi-purpose room, featuring math-related games that were played by students and their parents and siblings. At the end of the evening, after having had a lot of fun exercising their math skills, each student participant also received a gift basket that included a calculator, pencil, eraser, ruler and other items. Many thanks for the teachers who led the games at each table, including Ms. Buckingham, Ms. Colburn, Ms. Cook and Ms. Hamala. Thanks also to parent volunteers Anita Miller, who originally had the idea for Family Games Night, Saidah Said (coordinator), and Ying-Tsu Loh. Fairmont School won five grants from the Ed Fund for 2008-09. One of the school-wide grants was to help the PTA organize a Family Games Night in early 2009, an event in which parents learn Math-related games that they can play at home with their children. Another was to purchase new sports equipment for use in the Sports4Kids program. The other three are mini-grants to allow kindergarteners and third graders to delve into the world of insects and squids and fifth graders to learn real-life business skills from running a store. Special Ed pre-school teachers Ms. Roseline Soneda and Ms. Gail Cho wrote and were awarded three grants totaling approximately $1500 for communication equipment and materials to be used by all the special education teachers. Ms. Bonnie Janora, a kindergarten teacher, wrote and was awarded a grant of approximately $350 for materials for the kindergarten classes.